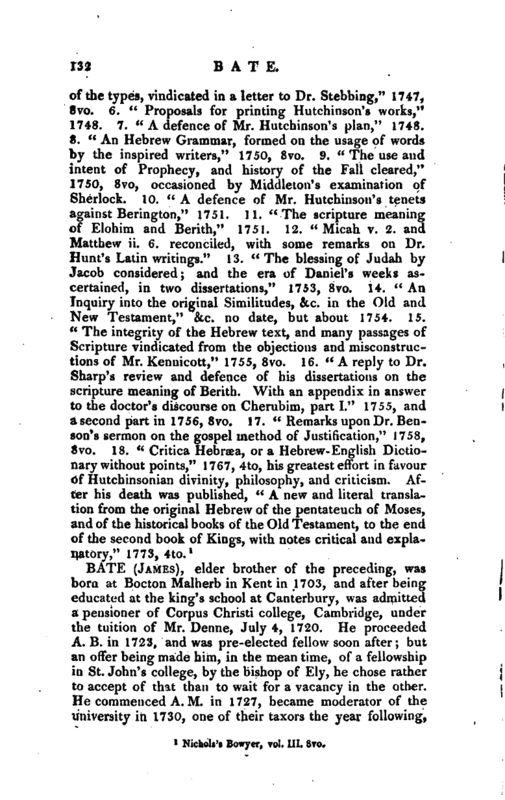 , an English divine of the Hutchinsonian principles, was a younger son of the Rev. Richard Bate, vicar of Chilham and rector of Warehorn, who died in 1736. He was born about 1711, and matriculated at St. John’s college, Cambridge, where he took his degrees, of B. A. 1730, and M. A. 1742. He was an intimate friend of the celebrated Hutchinson, as we learn from Mr. Spearman’s life of that remarkable author), by whose recommendation he obtained from Charles duke of Somerset a presentation to the living of Sutton in Sussex, near his seat at Petworth. 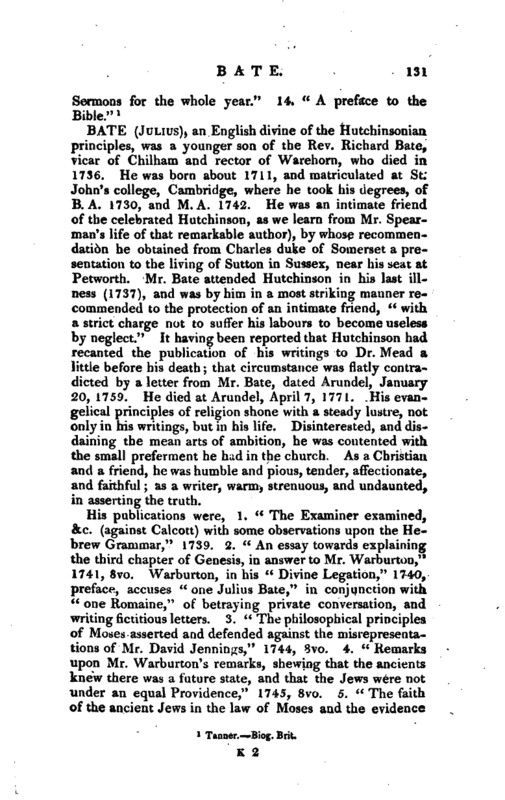 Mr. Bate attended Hutchinson in his last illness (1737), and was by him in a most striking manner recommended to the protection of an intimate friend, “with a strict charge not to suffer his labours to become useless by neglect.” It having been reported that Hutchinson had recanted the publication of his writings to Dr. Mead a little before his death; that circumstance was flatly contradicted by a letter from Mr. Bate, dated Arundel, January 20, 1759. He died at Arundel, April 7, 1771. His evangelical principles of religion shone with a steady lustre, not only in his writings, but in his life. Disinterested, and disdaining the mean arts of ambition, he was contented with the small preferment he had in the church. As a Christian and a friend, he was humble and pious, tender, affectionate, and faithful; as a writer, warm, strenuous, and undaunted, in asserting the truth. Nichols’s Bowyer, vol. III. 8vo.